In order to ensure that you get the most from our program, we have outlined the best practices that others have used to achieve optimum success. Need help? 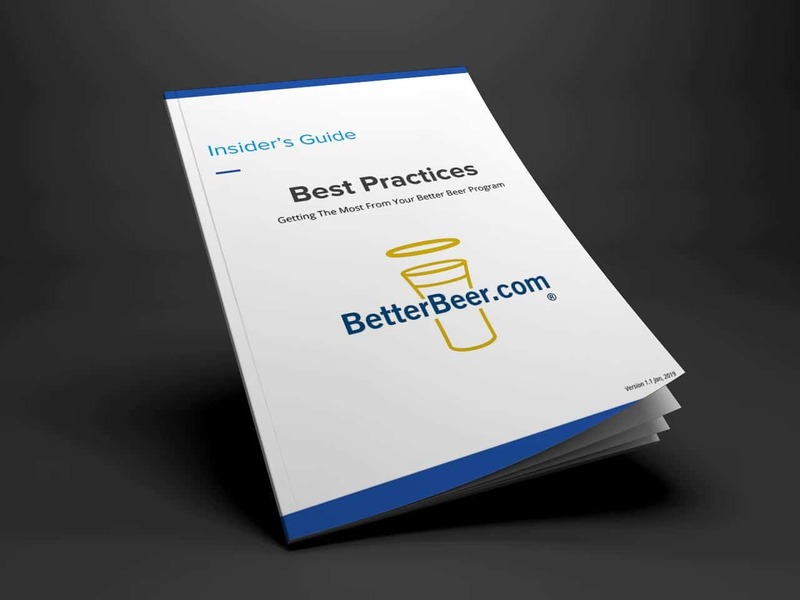 You can download our On-Boarding Manual here or watch some short help videos here. Who? : Best for anyone who sells or serves draught beer. Who? : Best for any Keyholder / Supervisor / Manager. Should be taken after Serve Better Beer Course. What? An online course that has 26 min of videos in 7 lessons that covers the basics of beer. Perfect for someone who is new to beer and looking to gain some confidence in beer knowledge for serving and bartending. Who? : Best for anyone who needs basic beer education. Should be taken after Serve Better Beer Course. What? 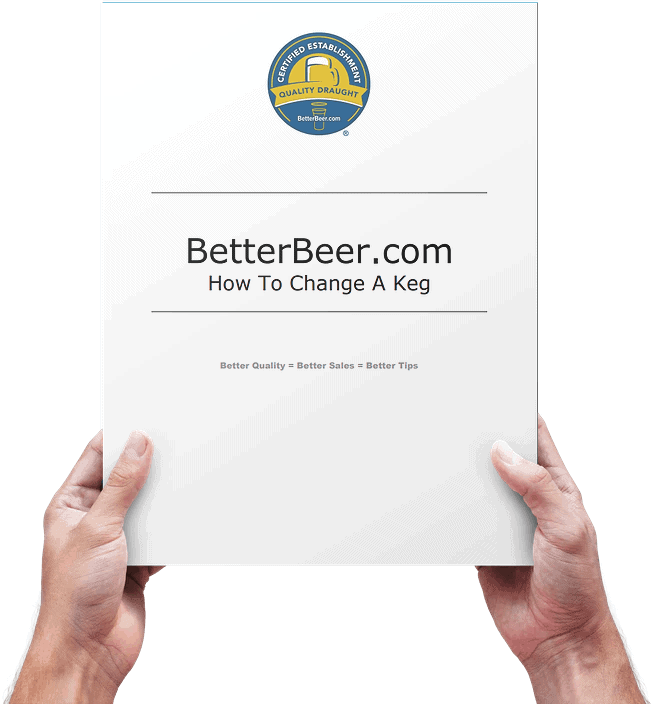 5 page manual with graphics on how to change a keg. Used with FOB instruction sheet. Who? : Best for Bussers or Barbacks who do not pour or serve beer, just change kegs. * Manual available in English, French, Tamil, Mandarin, and Cantonese. Post the correct FOB Instruction sheet inside the walk-in somewhere visible - either on the wall or the inside of the door. PRO TIP - staple one to each employee’s pay stub or post in the staff room / change / locker room. Ensure that there are sheets on the line cleaning log so that the cleaners can record line cleaning. Ensure that the water bottle remains in the walk-in on a shelf. Used weekly to ensure beer clean glasses. To be used on all beer glasses: flights, pints, mugs, jars, … Do not use for any glass that has not first been cleaned in the dishwasher. Ensure proper pour by staff. Print and leave behind the bar as a reference for proper pour and basic troubleshooting. Develop a nightly and weekly cleaning schedule for the glasswasher. Contact your supplier for details on what needs to be done. Ensure there is always a supply of cleaning solutions for the glasswasher and that no scale develops on the inside of the machine. Select one person to manage the program and ensure that all of the resources are being used. 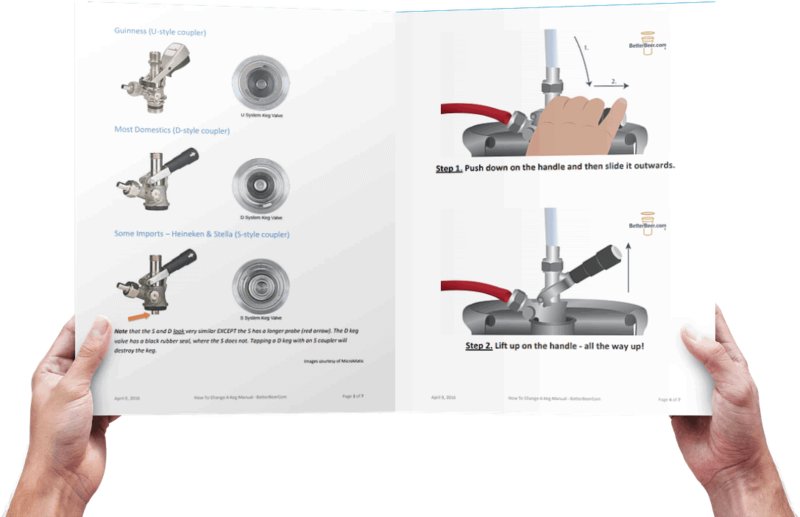 Print a copy of our draught manual and leave it in the office, behind the bar, or staff room as a quick reference. Print off the email that you receive from your monthly audit and review the To Do section at your Manager’s meeting. Some of our clients post the audit results on the outside of the walk-in so that staff and line cleaners can see the results. You can also access the review from the Admin section of our site. 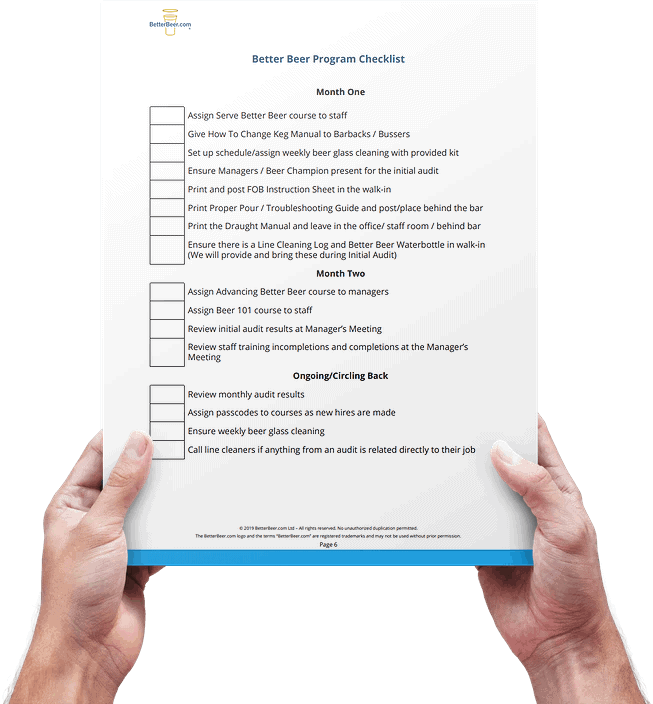 Download the manual to get an easy to use checklist so you don't miss anything.